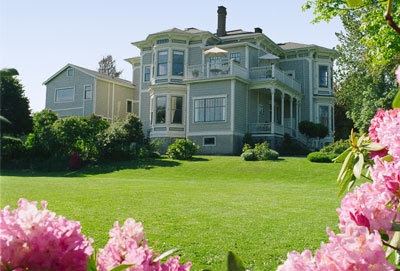 Fairholme Manor is located next to Government House in Victoria, BC. I stumbled across a link to an old home movie that shows a Canadian Pacific steamer journeying from Vancouver to Victoria and on to Seattle. The 1920s home movie includes shots of The Empress Hotel and the BC Parliament Buildings. It also includes exteriors of Government House in the tony Rockland area of Victoria. If you look closely, you'll see a large, white house pictured next door to Government House. It's Fairholme Manor, an 1890's Italianate mansion restored by owners Sylvia and Ross Main. Today it's an award-winning inn known for its lovely suites and fabulous breakfasts.